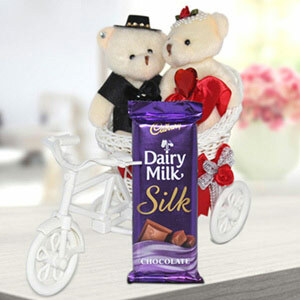 Get this lovely couple figurine for the one whom you wish to convey your heartfelt feelings of love with a heartwarming gift. Being crafted intricately, this couple showpiece is an ideal gift choice for making an everlasting impression on dear one. Find it excellent to present as Valentine’s Day gift, housewarming gift, anniversary gift and more. This showpiece was of good quality and looked very beautiful. Thanks giftalove and do bring gifts like this more!